2018 Vaulting Session - Registration is now OPEN! Vaulting Clinics for NEW Vaulters and Walk/Trot Vaulters! Please email us at meadowcreekvaulters@hotmail.com for registration! 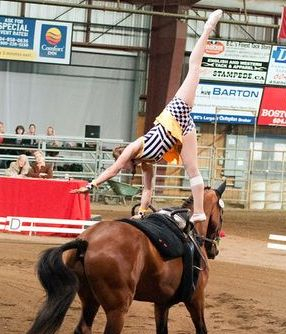 Vaulting Camp for Experienced Vaulters at Walk/Trot/Canter up to Division C Canter! This year's summer camp is aimed at vaulters experienced in vaulting and currently competing (walk D/C/B and trot D/C/B, and canter D/C), looking to further their vaulting skills, while enjoying a great time with vaulting friends during this 3-day camp! Camp dates are August 14/15/16, 2017! We hope to see you this summer for lots of vaulting fun at our clinics or camp!! Our 2015 Summer Vaulting Camp will be help August 12-14, 2015. New and Experienced vaulters are welcome - we will have a great time vaulting together: Individual, Pas De Deux and Team/Squad vaulting, Gymnastics Skills, Basic Horsemanship, Team Building and much more! Download the Information and Registration Forms by clicking here! Vaulters and horses of MCVC had a very successful weekend at CVI Canada Cup on May 28-30th in Chilliwack. Jeanine van der Sluijs with Oliver, lunged by Angelique van der Sluijs. Charlotte Axani with Kavalia, lunged by Angelique van der Sluijs. 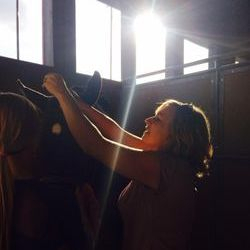 Heather Latimer with Kavalia, lunged by Angelique van der Sluijs. Dallyn Shields with Oliver, lunged by Angelique van der Sluijs. Avery Malone with Phlynnigan, lunged by Angelique van der Sluijs. Tiffani Matheson with Phlynnigan, lunged by Angelique van der Sluijs. Averill Saunders with Phlynnigan, lunged by Angelique van der Sluijs. Emily Stevenson with Phlynnigan, lunged by Angelique van der Sluijs.